German-born artist Björn Meyer-Ebrecht approaches the legacy of Internationalist Modernism with a sense of intellectual detachment. 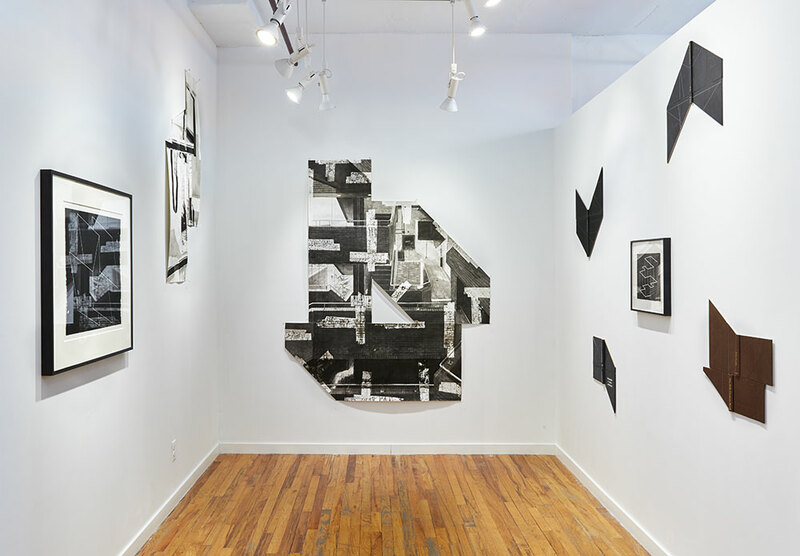 Through his drawings and sculptures, the artist investigates both the optimism and politics that underscored mid-century architectural and design aesthetics. 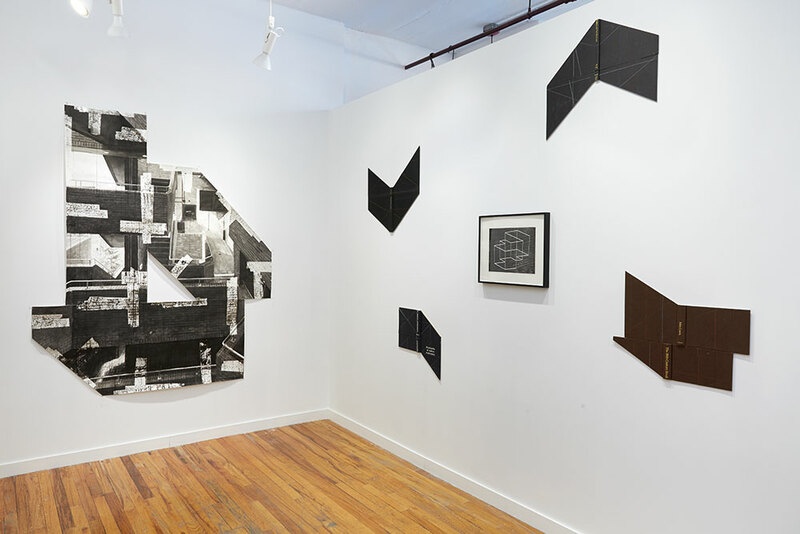 The exhibition’s title “Structural Constellations” refers to a particular series that fellow German artist Josef Albers worked on throughout his career. 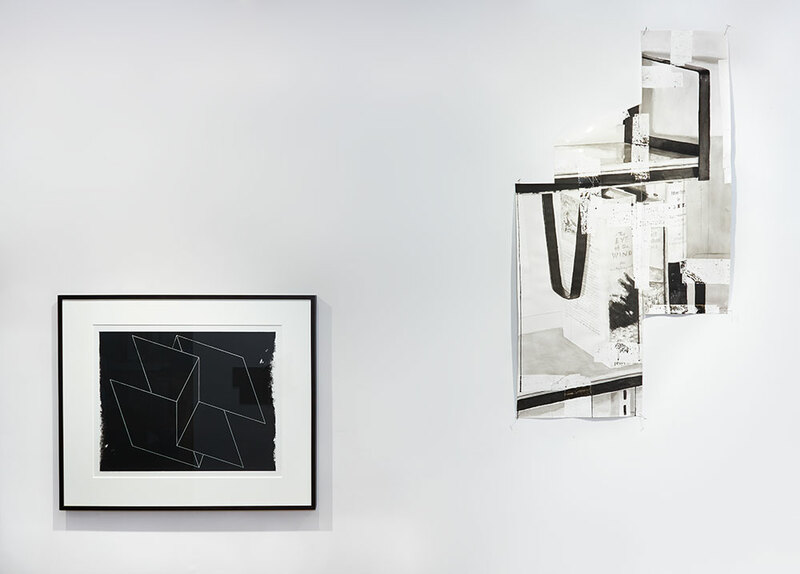 By bringing these two artists together a fruitful dialog about Modernism’s origins and repercussions is achieved. In his large format drawings, Björn Meyer-Ebrecht focuses on the architectural form. 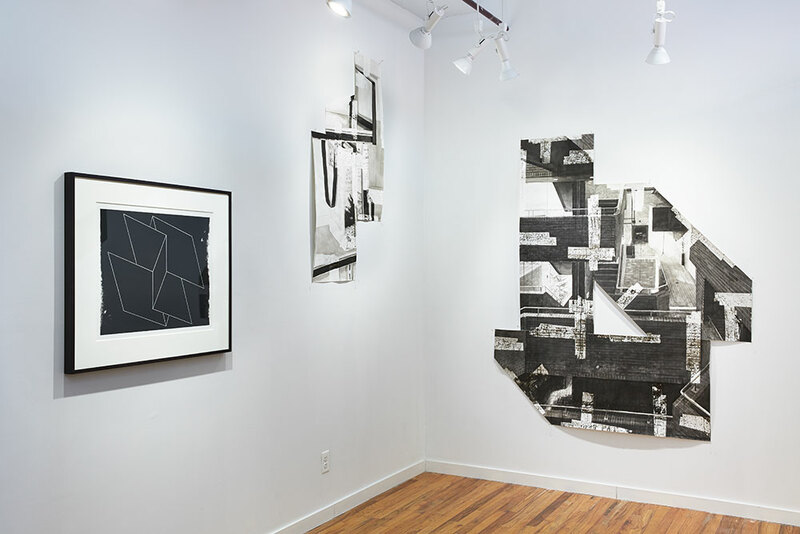 The images, made with ink on paper, explore examples of Modernist buildings, from both the exterior and interior perspective. 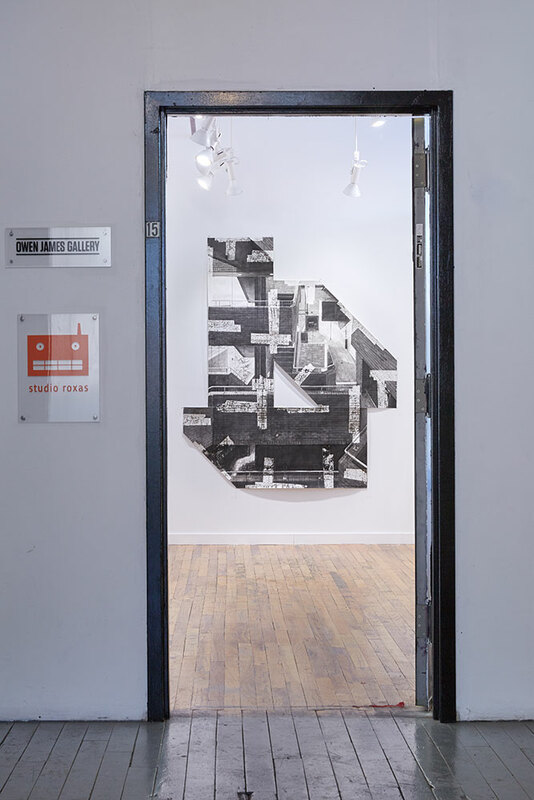 The drawings themselves reflect the notion of construction, as individual pieces of paper are taped together in irregular shapes that create a structure in their own right. Over this assembly exists a single, often monochromatic image. Through his configuration and choice of imagery, Meyer-Ebrecht explores the notions of space and design of the anonymous buildings and rooms, devoid of the people for which their function exists. Often created in tones of grey and black, these structures present a ghostly emptiness. The International Style grew from a desire to have functionality replace the bric-a-brac of individual cultural identities. In reality, the politics of the era did much of this removal work in real time, around the world. Thus, the stark forms highlight both the utopian optimism and grave context of the movement’s life-cycle. Upon further inspection, additional elements come into focus. The works remain unpopulated, but hints of Life emerge through the placement of Nature, either plants housed indoors or surrounding the structures. Occasionally color is sparingly added, a chromatic intervention that has started to transport these images from a documentary to a more contemporary role. The work of Meyer-Ebrecht resonates deeply w ith the S tructural Constellations of Josef Albers. Forever known as the Bauhaus teacher and masterful painter of color theory, Albers started work on this series before he began his mo re famous Homage to the Square series. In prints, drawings and engraved plastic, the series is fundamental to Albers’ thoughts on space and form. Absent of color, they depend instead on flat patterns of intersecting white or black lines and geometries. These often introduce optical illusions of space, freeing the abstract compositions from their streamlined surfaces. Albers’ series is represented here with two prints: Multiplex D (1948) and Interlinear N 32 bl (1962) which indicate the variety and chronology of his efforts in this direction. 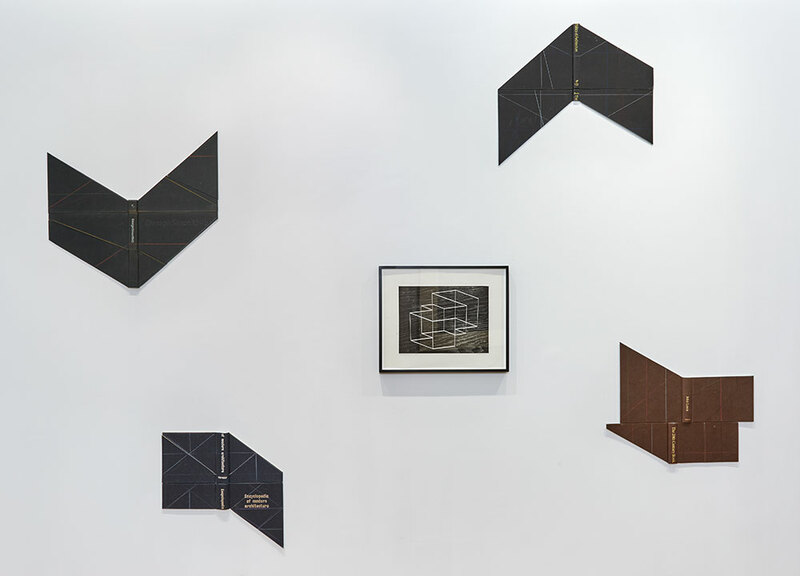 In another connection, Björn Meyer-Ebrecht mirrors his drawing constructions with a series of wall-mounted sculptures. These are composed of deconstructed and reassembled hardbound book covers, the type of academic tomes that contain information on par with the source material that he uses. The hard covers, removed from their fancier dust-covers, reveal their naturally stark sense of industrial consonance. They are cut and rearranged into angular insignia. The titles of the books, such as D esign Since 1945, remain. 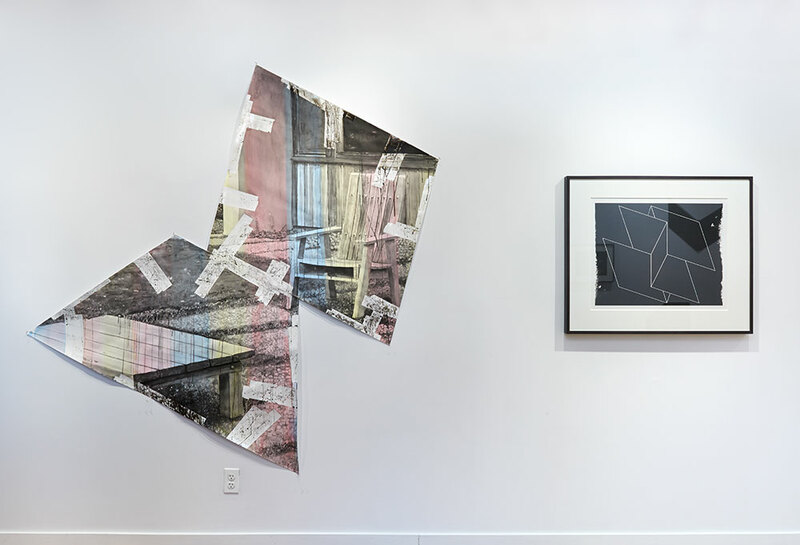 Visually the titles become part of the overall composition, alongside the thin colored pencil lines and additional slices that the artist has introduced around them. Thus, the scholarly definitions and defense of Modernism become its physical manifestation. Albers’ linear constructions are naturally reflected in the work of Björn Meyer-Ebrecht, and their connection, while not overtly intentional, is integral and unmistakable.